The house with 30,000 books offered Takuro Yamamoto Architects an opportunity to develop the concept of living in connected but separate spaces in the city of Tokyo, where there is always very little space available due to high land costs, driving architects to optimise use of land, raising the issues of the home’s relationship with its neighbourhood and the distance between buildings. Two homes were requested for two households, consisting of a couple with a child and the child’s grandfather; the architects designed the division and layout of the homes on the basis of a line that marks the boundary between them, but also acts as a bridge. In the layout, this line becomes a real room, the biggest room in the two apartments, the one containing the 30,000 books that the two households decided to share. The lot on which the home is built measures about 200 square metres, set between other homes and little vacant spaces. The building almost completely occupies the site on which it stands, with the exception of a walkway around it, but Yamamoto studies the landscape to make sure that the main windows overlook the small spaces around the home without any buildings on them. A library with 30,000 books - about the size of a small public library – divides the area in two along a diagonal line crossing the layout of the home and connecting the two most open points in its perspective. To underline these opposed views, the architect has created two glass walls broken up into a number of windows that light up two walls covered with books in a room two floors high. Each of the homes is directly connected with the library, a large-scale space contrasting with the smaller spaces of the two apartments, becoming a foyer and a room for receiving guests. The windows, facing southwest and northeast, are divided into multiple openings with leafs of different shapes and sizes permitting control of sunlight and ventilation so as to protect the books and create the right environment for the two households’ activities, either together or separately. While symmetrical in relation to the library, the two apartments have very different floor plans. Built on two levels, they have living areas and bedrooms in an opposite layout: in the grandfather’s apartment, which is slightly smaller, the bedroom is on the ground floor, while the big living room is on the first floor; while the family’s apartment has a big living room and kitchen on the ground floor, with the bedrooms on the upper level. The small windows around the perimeter make the lighting in these private rooms very different from that in the library, a semi-public shared space. 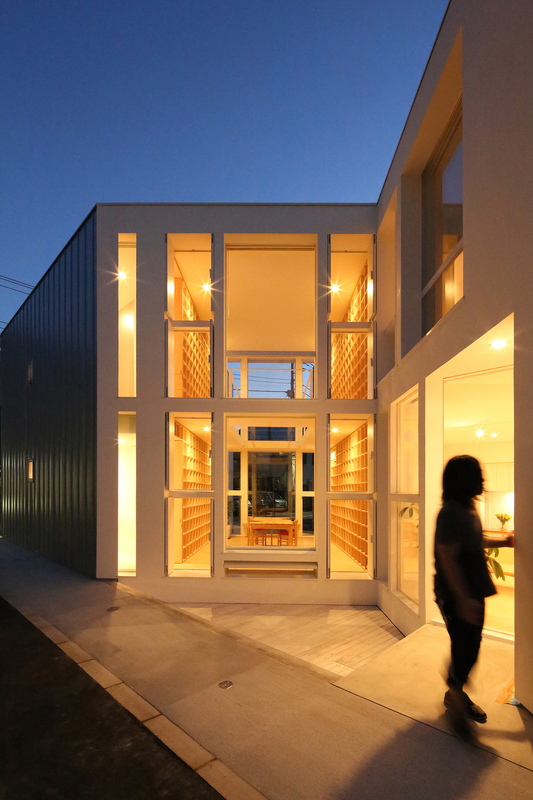 In the triangular fragments left between the outside of the home and the library, Yamamoto creates two little stylised “gardens” on a lower level, with wooden flooring, acting as a symbolic filter between the entrance and the world outside, the street and the other homes. 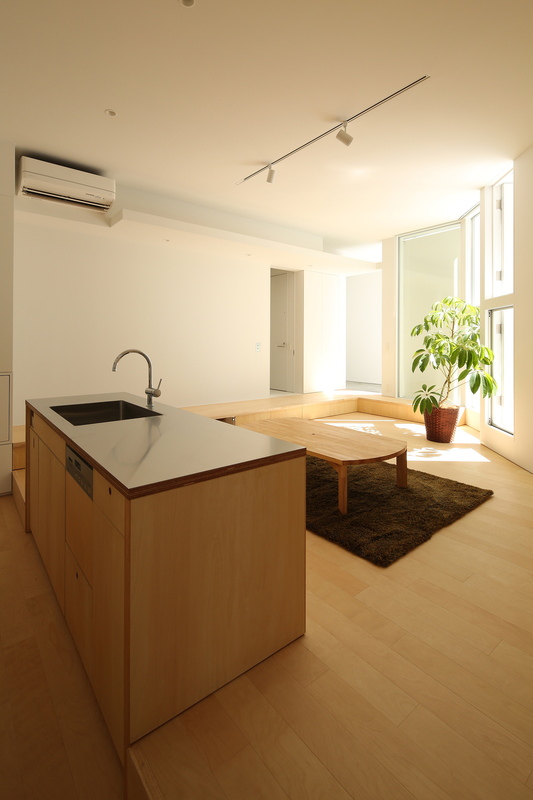 As we have seen in much Japanese architecture in recent years, attention to detail is a key to Takuro Yamamoto’s project: from the fine white tubular handrails to the painstaking design of the windows, the walls of double height in the library, the design of the tables and chairs and the essential contrast between the white walls and the natural wood flooring.